Donald Trump has revoked the security clearance of ex-CIA chief John Brennan, denying the US president's critic any access to sensitive information. White House press secretary Sarah Sanders announced the decision by reading a statement from Mr Trump. The statement cited Mr Brennan's "erratic conduct and behaviour". In response, Mr Brennan tweeted that the move was part of President Trump's broader effort to "suppress freedom of speech and punish critics". "It should gravely worry all Americans, including intelligence professionals, about the cost of speaking out. 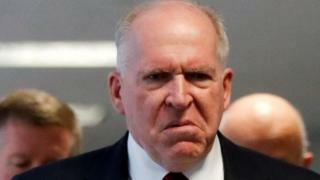 Mr Brennan earlier said Mr Trump's performance at a briefing after July's summit with Russian President Vladimir Putin in Helsinki had been "nothing short of treasonous". And last year, Mr Brennan said an investigation into possible collusion between Trump campaign officials and Russia during the US presidential elections in 2016 had been "well-founded". President Trump has repeatedly denied the claim, calling it "witch hunt". Later on Wednesday in an interview with the Wall Street Journal, Mr Trump said he would have revoked Mr Brennan's clearance last week but it was "too hectic". What did Trump's statement say exactly? 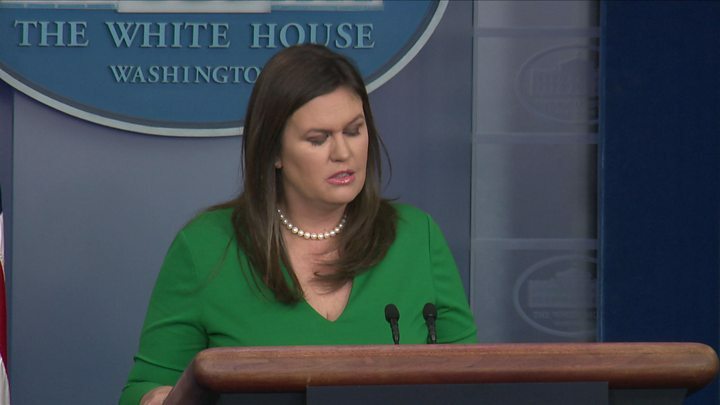 Media captionSarah Sanders read President Trump's statement which cited John Brennan's "erratic conduct and behaviour"
"As the head of the executive branch and commander-in-chief, I have a unique constitutional responsibility to protect the nation's classified information, including by controlling access to it. "I have decided to revoke the security clearance of John Brennan, former director of the Central Intelligence Agency. "Historically, former heads of intelligence and law enforcement agencies have been allowed to retain access to classified information after their government service so that they can consult with their successors, regarding matters about which they may have special insights and as a professional courtesy. "Neither of these justifications supports Mr Brennan's continued access to classified information." The statement added that Mr Trump was also reviewing access to classified information for former FBI chief James Comey, whom he fired last year, former director of national intelligence James Clapper, former National Security Agency director Michael Hayden and former attorney general Sally Yates, among others. James Comey called the president "morally unfit" to lead. His memoir, A Higher Loyalty, likened Mr Trump to a mob boss. In response to Mr Brennan losing his clearance, Mr Comey said in a statement: "Once again this president is sending a message that he will punish people who disagree with him and reward those who praise him." He added that "security clearances should not be used as pawns in a petty political game to distract voters from even bigger problems". Mr Comey also said the president "lies to the American people every day, encourages racism, is a misogynist, and always puts his own interests" first. James Clapper said the Watergate scandal "pales in comparison" to the Russia collusion inquiry dogging the Trump presidency. In a naked jab at the Trump administration, Michael Hayden tweeted a photo in June of a Nazi death camp with the caption: "Other governments have separated mothers and children." John Brennan has been an outspoken critic of the president. He called Donald Trump treasonous over his meeting with the Russian leader in Helsinki; he's called him imbecilic; and a danger to the US. Now Donald Trump has had his revenge, revoking the former CIA chief's security clearance - and threatening a number of other national intelligence officials - all of whom have one thing in common: they've also been critical of the president. But in justifying this move there's been no suggestion that Mr Brennan either leaked classified material or sought to make money from it. Instead the White House statement spoke of Mr Brennan's "erratic behaviour", "wild outbursts" and "frenzied commentary". The decision by the president was apparently taken without consulting his director of national intelligence, Dan Coats. And the move has brought criticism. Former Secretary of State John Kerry said the president was behaving like the ruler of a banana republic. Others have said Mr Trump is trying to shut up critics. The timing is also noteworthy. The White House has been buffeted for days by claims from a disaffected former adviser to the president. Closing arguments in the trial of Donald Trump's former campaign manager, Paul Manafort, are also being heard. The White House briefing where this was announced hadn't been scheduled. It looks like a concerted effort to change the subject.